This is a book about passion. But it is passionless and flat, weirdly autobiographical without being introspective or emotional, written extremely simply… and aimed at people who are just clearly not at all like me. No, this is not a good review. This book was a struggle. For weeks I have persisted, tried, opened it, struggled, sighed, and given up. For weeks on end there has been this battle in my house; the book, cover blazing red, staring up at me from the coffee table. Me attempting to stare it down, picking it up, carrying on valiantly, putting it down again. It shouldn’t be this hard. This author is apparently Australia’s #1 influencer on LinkedIn, has been a shark on Shark Tank. I wouldn’t know; I don’t watch TV. And she’s never in my LinkedIn feed. And she writes like you’re a freaking five year old child. 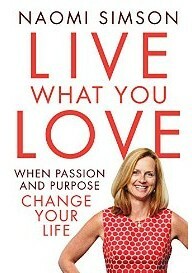 Naomi Simson’s book is not for someone like me. It is written for mothers, for women who haven’t thought about doing anything much on their own for many years, are afraid of doing their own thing, and want a step-by-step, warming, cuddly blanket version of starting a business. The intended audience for this work is the person who has never read, or listened to, anything by Richard Branson, Tony Robbins, Tim Ferris, Noah Kagan, Seth Godin, Jim Rohn, or even Steven Covey. The audience is one that doesn’t have hobbies, doesn’t have their own passions, doesn’t know what turns them on. And honestly, when it came to reading this all I could think was, Honestly? People like that exist? Humanity is doomed. It might be unfair of me to be that way when I didn’t finish the book. Full disclaimer: After a third of the way in, Skip Mode was initiated. Flick some pages, dip in to see if it’s changed, sigh and put it down. The style of the book is really for those who are completely out of touch with themselves, which might explain why it is so very simplified. Now, usually, plain English rocks the socks off me. This, however, is written so simply that a kid younger than my 11-year-old niece could read and understand it… if it didn’t bore them shitless. It’s also way too long. Wondering what it was about this book that caused such a violent reaction, this critic resorted to counting how many instances of ‘I’, ‘me’, and ‘my’ were on each page. The author refers to herself, consistently, in excess of 18 times on most pages. run or owned more than one business, and thus had more than one case study (one business in 360+ pages? Jesus H). But the most irritating thing about this work is that the tone is flat. It is completely, utterly flat. So, either the author didn’t write it and it was badly ghost written; the editor took all of the author’s personality out; or it was even longer than this and had to be pieced back together in a way that kind of made sense. It’s extremely rare to come across a book that is so devoid of passion. Odd, don’t you think, in a book about passion? If you want to prove me wrong and make loads of comments about how whizbang awesome this book is, you can buy it at Dymocks. But I don’t encourage it. Go read Daring and Disruptive instead, and feel the passion leap off the page. This title was sent for review by Dymocks Books Australia. Sorry you had to cop such a scathing review, guys. Dear reader, at least you know it ain’t pay for play… but I doubt they’ll send me more after this! Next article Ride the wave, Sunshine. I am on Facebook there’s a link to page on my blog & I will go find my page!